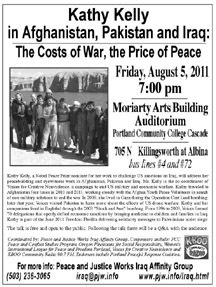 Kathy Kelly, a Nobel Peace Prize nominee for her work to challenge US sanctions on Iraq, will address her peacebuilding and eyewitness work in Afghanistan, Pakistan and Iraq on Friday, August 5 at 7 PM at the Moriarty Arts Building Auditorium at Portland Community College Cascade Campus (705 N Killingsworth at Albina). Ms. Kelly is the co-coordinator of Voices for Creative Nonviolence, a campaign to end U.S. military and economic warfare. The title of her talk is "Kathy Kelly in Afghanistan, Pakistan and Iraq: The Costs of War, the Price of Peace." Following her talk there will be a Q&A with the audience. Kathy traveled to Afghanistan three times in 2010, working closely with the Afghan Youth Peace Volunteers in search of non-military solutions to end the war. In 2009, she lived in Gaza during the Operation Cast Lead bombing; later that year, Voices visited Pakistan, aiming to learn more about the effects of U.S. drone warfare. Kathy and her companions lived in Baghdad throughout the 2003 "Shock and Awe" bombing. From 1996 to 2003, Voices activists formed 70 delegations that openly defied economic sanctions by bringing medicines to children and families in Iraq. Kathy also headed to Gaza on the "Freedom Flotilla II" in June 2011, and was prevented from visiting Palestine both by sea and after flying into Israel. With increasing calls for the troops to come home from Afghanistan, a looming deadline to withdraw from Iraq in December, and drone attacks reported at a rate of about twice weekly, Kelly's talk promises to be informative and transformative. The talk is free and open to the public. It is being organized by Peace and Justice Works (PJW) Iraq Affinity Group and is co-sponsored by the PCC Peace and Conflict Studies Program, Oregon Physicians for Social Responsibility, Women's International League for Peace and Freedom-Portland, Voices for Creative Nonviolence (Chicago), Peace Action West, and KBOO Community Radio 90.7 FM. It has been endorsed by Portland Peaceful Response Coalition and Sisters Of The Road. Flyers for the event can be found at http://www.pjw.info/kathy_kelly_0805 11_flyer.pdf .